How the high cost of living impacts housing options. If you own a home in Essex County, times have probably been good. Since 2000, the median home value has increased 23% to $373,400. If you don’t own a home, it may seem far out of reach. Essex is quite an unaffordable place to live – by both common measures. For homeowners, affordability is assessed using a ratio of median home value to median income. Essex County’s ratio is 5.1, when the 2-3 range is considered affordable. For renters, rent is considered affordable if it takes up no more than 30% of income. In Essex County, renters are spending about 37% of their income on rent. 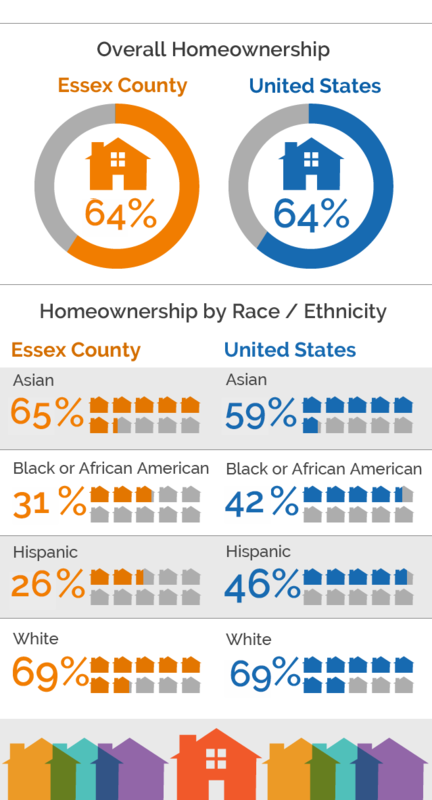 Who owns a home in Essex County? Homeownership in Essex has been steady since 2000, with 64% of housing units occupied by owners. But in some local areas, and for some groups, homeownership is far less common. Only 28% of homes in Lawrence were owner-occupied in 2013-17, along with 44% in Lynn and 51% in Salem. Homeownership rates are 69% among white residents, but just 31% for African Americans and 26% for Hispanics – far below national rates for those groups. Local zoning laws make it difficult to develop affordable and/or multi-family housing in some areas. Some towns allow only single-family homes on large lots, which limits housing supply and escalates costs. The Commonwealth enacted Chapter 40B in 1969 to mitigate this problem by setting a goal that 10 percent of housing inventory in each town or city is affordable. However, in Essex County, only 7 out of 34 communities have met this goal: Beverly, Danvers, Georgetown, Lawrence, Lynn, Lynnfield and Salem. Homelessness is a significant problem in Essex County. 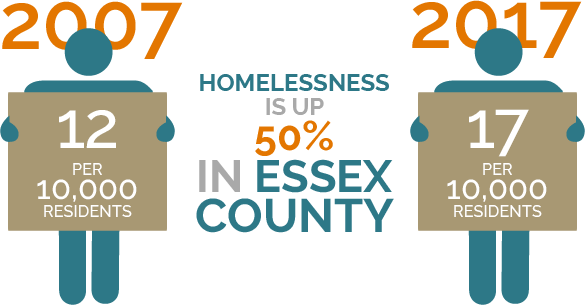 Homelessness in Essex County is up nearly 50% since 2007. In 2017, on the night of the homeless count, 1,300 people in Essex County were without a place to live. Essex's increase has occurred as the rate in the state has increased more gradually and the national rate of homelessness has declined. But homelessness in Essex County has actually declined a bit since 2015, when the count identified more than 2,000 people, for a rate of 26. In July 2015, the state of Massachusetts’ Department of Housing and Community Development (DHCD) launched a homelessness prevention initiative; early success in the program led to the scheduled closure of hotel-based shelters. By mid-2017, hotels - many located in Essex County - had stopped being contracted by the state family shelter system to serve as overflow facilities. 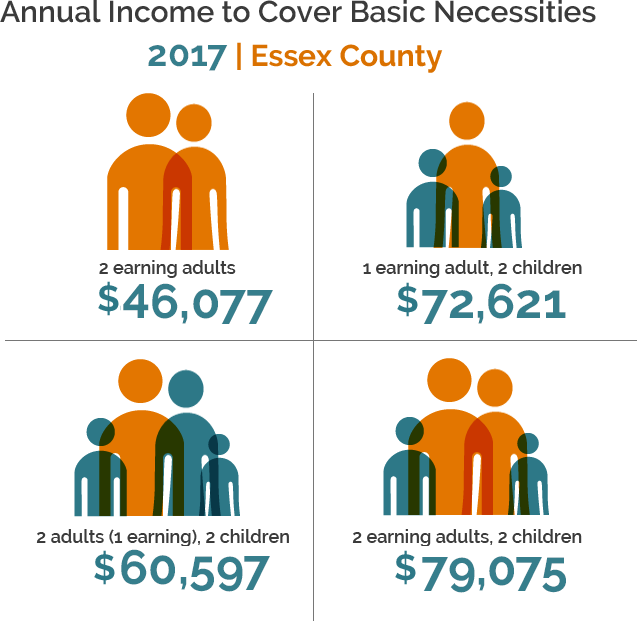 Essex’s housing problems aren’t driven by an overall high poverty rate or low incomes, but it’s an expensive place to live. Estimates of the “living wage” required to afford basic necessities, including shelter, suggest that many families, particularly single-parent families, don’t make enough to make ends meet. For example, the annual income required for a single parent of 2 is estimated to be about $73,000. Compare that to the median income for female-headed households with children: $29,000. In what ways is unstable housing impacting Essex County? We don’t have data specific to the homeless or housing-insecure population to answer this question. But we know that physical health, mental health and educational performance are all affected. How Essex County can make safe, secure, affordable housing available to all residents is a key challenge facing the community.